Alcohol purchases must be justified for business-related purposes, e.g., business meals or university events. Alcohol purchases must be charged to discretionary funds. Conference (earnings) funds may also be used if the reception, meal, or similar event is included in the registration fee paid by the attendee. All alcohol must be charged to account 64430. Documented approval per the departmental Delegated Signature Authority must be submitted to the College for all instances. Alcoholic beverages are unallowable on sponsored projects. Amounts expended for the purchase of alcohol must not exceed $20 per person (excluding tax and tip). Spending in excess of the per person limit could result in not being reimbursed the overage amount or being required to reimburse the University if a PCard was method of payment and the exception to policy is not approved by the Dean. Alcohol may not be served in an on-campus non-licensed facility during normal working hours (9am – 5pm). Alcohol is approved for dinner only, not for lunch meals. The number of invitees to a business meal related to faculty recruitment should be kept to a reasonably justified minimum. As a guideline, four (4) participants plus the guest should be the maximum. Prior approval from the Office of Business and Finance must be obtained if alcohol is to be served at a university event in a non-permanently licensed campus location, e.g., atrium, conference room. To arrange for such approval, a request must be submitted to the college office at least three (3) weeks before the event. ‘University events’ include seminars, symposiums, or any gathering of University business. The request is to be completed by the department’s responsible party, approved by the Chair/Director and then sent to the college office for Dean review/approval. Security measures noted on the request form must be comprehensive. The request will be forwarded on to Business and Finance by the college office. Alcohol may not be served at the event until the department receives written B&F approval. The Authorization to Serve Alcohol Request form and instructions may be obtained from our forms tab. The University has specific guidelines regarding alcohol for holiday parties held on University property. These guidelines should be reviewed before planning an event. Departmental holiday parties held off campus at a personal residence, require prior approval. Business meals at off campus locations (restaurants) do not require prior approval. *Purchase orders must be created prior to ordering or receiving goods/services. After-the-Fact generated purchase orders are considered a policy exception and require college-level approval. 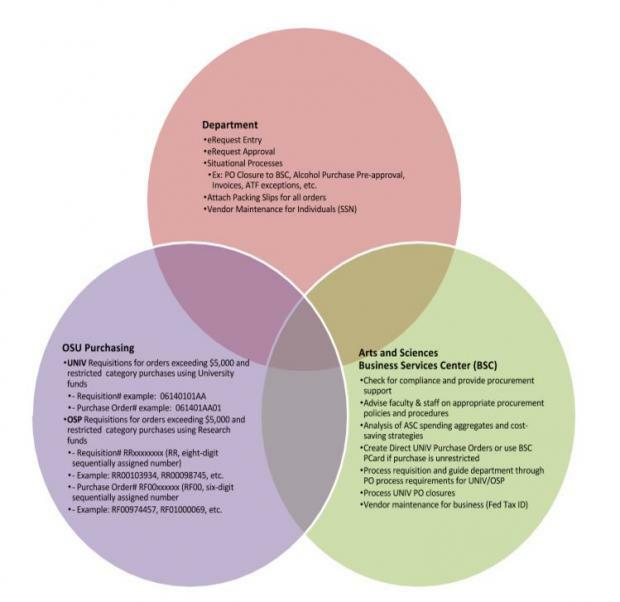 The Ohio State Purchasing Department has implemented cost savings initiatives by establishing favorable contracts for the University. These contracts are divided into three categories: Key, Preferred and Strategic. For reference, the complete contract book is available at purchasing.osu.edu/sourcing/default.aspx. Key contracts, listed below, have a mandated 100% compliance. Use of a non-contract vendor in lieu of the contracted vendor is a policy exception and requires college-level approval. If a valid business purpose/rationale is not given for the exception, the transaction may be denied and payback of funds to the university will be required. Practical exception: Purchase of beverage items not available from Coke. UPS – Only UPS may be used for outbound shipping. It is not a policy exception to pay for non-UPS inbound shipping charges, as we cannot control other institutions/companies shipping methods. Practical exception: When it can be proven that UPS is not able to correctly or safely ship perishable items, e.g., shipments using dry ice that must be moved quickly to avoid ruining the item(s). Staples – Ordering via eStores catalog is preferred. If item is not available through eStores, the procurement card may be taken to a Staples store. Practical exceptions: 1. Item needed is not available at Staples (eStores, on-line or storefront) and there is no adequate substitution. 2. A price comparison is documented that the identical item is significantly less expensive from a non-contracted vendor. ComDoc – Xerox multi-functional devices (printer/copier/fax/scanner). Preferred and Strategic Contracts are the contracts listed in the contract book for each category. Purchasing has negotiated these to get the best price for the University and prefers that these contracts be used. Preferred Contracts: Special pricing negotiated for the University with multiple vendors to choose from in eStores catalog. Some examples are: Catering; Hardware & Building Supplies. Strategic Contracts: Negotiated zero freight, handling charges and free returns. Some examples are: Computer Hardware & Peripherals; Laboratory Supplies. Use of Preferred and Strategic contracts is not required, but if using a non-contract vendor, an explanation why must be documented in the eRequest. To purchase off contract, if the desired vendor is not in the University Vendor file, no new profile will be created and inactive vendors will not be reactivated for the purpose of creating a PO, making the PCard the preferred method of procurement. Effective 8/1/2013 the Business Services Center will begin using a service center pcard for department purchases up to $7,500 when appropriate. Departments should continue to use their department-specific pcards as they currently do and designate those eRequest transactions as Pcard Preferred. Department initiates eRequest & selects Standard Request. BSC reviews transactions for compliance and determines which procurement method/vendor to use. BSC makes purchase using BSC pcard when appropriate. Department attaches receipts, packing slips, etc. to eRequest when items are received. Restricted categories will continue to go through central Purchasing. OSP-funded purchases will move forward as requisitions. BSC Procurement associate will reallocate expense per approved eRequest. BSC pcard approvals will be done by Procurement Lead. Department reconciles transaction to the GL. What is the PO Closure Process? The PO Closure Process is a manual process, which permanently relieves any encumbrance against a purchase order. PO Closure is FINAL - there is no reversal. Once marked, the Purchase Order will close immediately and return any encumbrance to the chartfield associated with the Purchase Order. When should the PO Closure Process be used by departments? The PO Closure process should only be used to release encumbrances on POs for which there is certainty that no further invoices (vouchers) are pending or forthcoming. Issue change order in the Financials system? If the quantity vouchered is less than the quantity ordered, you must request a change order in the eRequest system in order to relieve the contractual obligations with the supplier beforeclosing a Purchase Order (this may not apply to all PO Types). Have receipts been entered for all capitalized and tracked non-capitalized assets associated with the Purchase Order? Receipts must be entered for all capitalized and tracked non-capitalized assets beforerequesting closure. Amount matched equals amount invoiced? A Purchase Order cannot be closed if there is a match exception. Refer to the PO Activity Summary [pdf] screen in the Financials system to verify amounts match before requesting the closing a Purchase Order. A Purchase Order cannot be closed if there is no voucher activity. Refer to the PO Activity Summary [pdf] screen in the Financials system to verify voucher activity before requesting the canceling of the Purchase Order. Please contact your BSC buyer for more information. require the AM0004 form (mobile equipment that could be reasonably expected to be used off-site or other equipment that will be physically taken off-site or received away from university premises). These forms should be signed utilizing DocuSign. i.e. flash/thumb drives, removable storage media, speakers, keyboards, desktop printers, monitors, etc. Items that fall within the scope defined above must be inventoried and tracked annually following the guidelines and procedures listed below. Fiscal officer who processes the purchase or reimbursement for the item. For all units, the tag must be placed on a flat, visible surface within 30 days of receiving the item and the tag number must be recorded with the rest of the inventory information for the item. The Office of the Controller has non-capitalized asset tags available at no cost. Contact DeAnn Willis-Berry for tags, 614-292-6048, Willis-Berry.1@osu.edu, Office of the Controller. The non-capitalized inventory must be reviewed annually to verify/update each item’s information (especially location, AM0004 form if needed, and person responsible), or to retire any non-capitalized assets no longer held by the unit. Each unit must confirm that its non-capitalized equipment self-audit is completed during the annual University equipment audit process. All requisitions for Radioactive Material must be approved by Radiation Safety before the requisition can be forwarded to OSP or University Purchasing so that it can be dispatched to vendor. Radiation Safety will approve any order that appears on their People Soft work list before 3 pm the same business day. PLEASE SUBMIT YOUR RADIOACTIVE MATERIALS ORDERS TO THE BSC BEFORE 2 PM TO ENSURE THAT YOUR ORDER IS PROCESSED IN TIME FOR THE RADIATION SAFETY DEADLINE. Approvers: please mark all radioactive orders as Critical. Initiator should type “RADIOACTIVE ORDER” in the vendor line prior to vendor name so the BSC can identify it from all other orders. Instructions for ordering radioactive material can be found on the Environmental Health and Safety Site. Perkin Elmer and MP Biomedical are the two most common vendors for radioactive material. Business Purpose must be: “Order for Radioactive Material” with any additional information required to fit an appropriate business purpose. If you need radioactive material on a particular day, please indicate that in your eRequest in “Additional Information”. Always include the names of the approved supervisor and the name of person using the radioactive material. Description must include complete Catalog Number, Isotope, Activity and Compound. Account number for radioactive orders is always 61212. All radioactive material must be shipped to 1314 Kinnear Rd (126-103) and then delivered to the labs. Issue: Tips in excess of the allowalble 20%? Guidance: Purchasing non-Coke products is unallowable per University Purchasing's mandatory key contract. The college should be contacted for exception approval before reimbursement can be processed. This policy should be communicated to all faculty, staff, and students.